Can never go wrong with ice cream and cake. Even better? 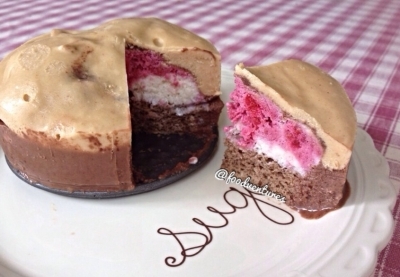 A healthy mugcake topped with protein ice cream. This is a treat you can eat without the guilt. Combine ingredients and microwave for 1 min 30 seconds or until cooked all of the way through. Set aside and prepare your "ice cream"
Combine your yogurt with almond milk and vanilla protein powder. Divide this in half and place one of them in the freezer (this will be your vanilla). Add your fruit to the other half of the mixture and freeze. Once frozen, place your mugcake into a mini springform pan and top with your proyo ice cream. Melt a spoonful or two of dark chocolate dreams and mix with your almond milk. Pour this on top of your ice cream so it's half covered. Freeze. Once frozen, do the same with your natural pb and freeze. Enjoy!